Welcome to our basic guide to racing on Zwift. The aim is to try and answer any questions you may have about joining the correct category or race results. For BRT races, you can use our handy calculator. A rider’s category is decided using 95% of their best 20 minute effort during a race, irregardless of length. ZwiftPower does not use your average power for a race, which is a common misconception. So the calculation is (20min power × 0.95) ÷ rider weight (in kg). E.g. a 70kg rider with 245W = 3.5W/kg, which would put the rider into category B. The calculation is essentially how your FTP is calculated by many FTP tests in a W/kg format. First and foremost, always check an event’s description. Not all races use the same brackets for their categories! Before you join a race, you’ll need to know your W/kg potential. The best way to find this out is to perform an FTP test via Zwift’s workout section. If you don’t fancy that, then the second best option is to join a race that either doesn’t use categories—such as a time trial race, or join the (A) category of a race. However! As earlier stated, this is not the only category system out there! Read the event descriptions! For example, the Ages Racing League uses age-based categories, and the Wild Women League uses 3.7W/kg and over for the A category. 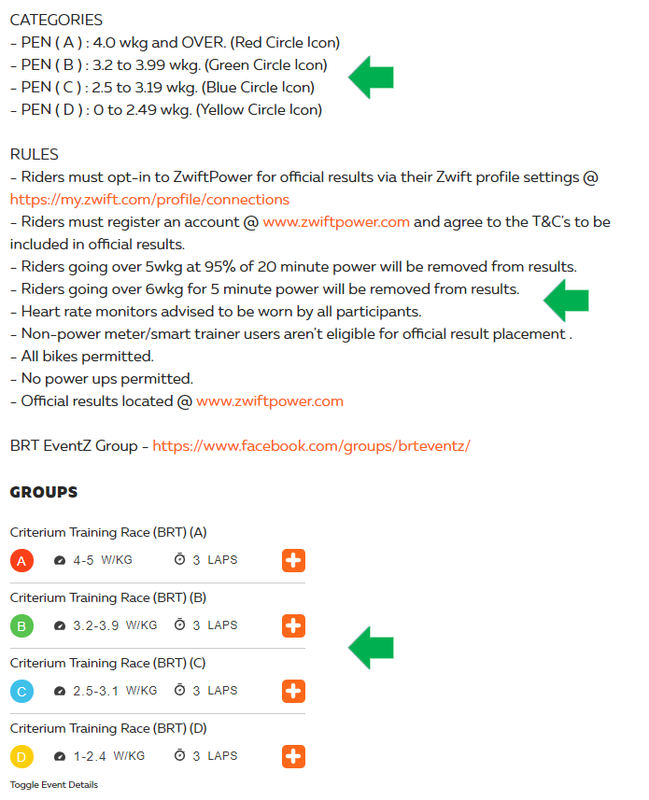 In the event description you may find some additional rules that the race organizer requires you to comply with to get an official result at ZwiftPower. These can range from wearing heart rate monitors, to no power–ups, TT bikes only, or no results for zPower riders (no smart trainer/powermeter). So have a read beforehand, as there’s nothing worse than putting in an all out effort only to find you’re missing from results. While touching on missing results, it’s worth mentioning GDPR. Since GDPR’s introduction, racers who want to be included in results will now need to opt–in to ZwiftPower via Zwift, as well as having a ZwiftPower account, and agreeing to the terms and conditions. To make your life easier, we have a guide to help you set everything up correctly. If you find yourself removed from results during your Zwift racing career, take a look at the codes below which have explanations to why you were removed. It’s always best to rectify the issue before your next race, or you may find yourself missing from the results on a regular basis! UPG/UPGRADE/WKG: rider has gone over category limits and must upgrade to the next category for the next race. HR: rider has been removed from results for failing to wear a heart rate monitor. ZP: rider has been removed from results for not using a smart trainer or powermeter. ZADA/5WKG: rider has breached the (A) category threshold and requires their data to be verified from real world data via ZADA (5W/kg for 20 minutes, 6W/kg for 5 minutes). To submit data, click on the link in your ZwiftPower profile. UNK: rider’s data—age, for example—is missing, causing category placement issue. A crucial part to entering a race is joining the correct category, that’s those letters you see in coloured circles. For each race the categories may have different parameters, so it’s important to read the description. Any good event organizer will list the category options/parameters with basic rules for the race. They may also publish links in the description for Facebook groups or websites, which may contain additional information or a direct contact to the race organizer. So reading the description or checking the web links out in advance will give riders a better understanding of what the race entails. One of the best ways to make contact with an event organizer is via the event’s Facebook group. Now if you read the event description, you’ll know exactly where to go. 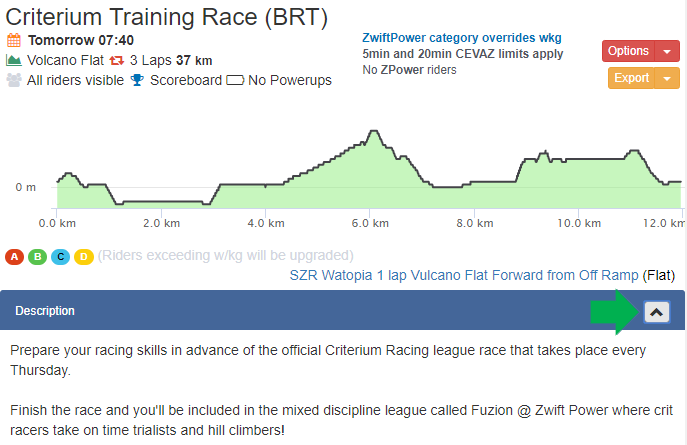 ZwiftPower now has a functional forum with a general area for questions and subgroups for each organizer’s events. Your third option is to try the Zwift Racers Facebook group, where the majority of organizers reside.